Bring a mat, blanket & pillow to class! You will experience both passive and active vocal sound healing. Passive vocal sound healing is when you experience Gwendolyn singing and making vocal sounds to bring in the frequencies of pure love and light. Active vocal sound healing is when you soften your throat, connect your throat to your heart, and activate your voice to become a tool for clearing & strengthening your spirit and body. We will sound together and sing together as women, and create enormous change! Registration for this 6-Month Group is: $300. Space is Limited: Register to Reserve Your Space. Payment plan available upon request. Discount available if you have a 30-minute consultation with Gwendolyn before class begins. Contact Gwendolyn with questions at Gwendolyn@vocalsoundhealer.com; (520) 904-2043. 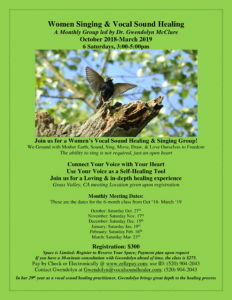 ← Ancient Voices & Our Voices A Vocal Sound Healing Retreat in Ireland 2019! !